The Audi A6 Allroad is a car that combines the best parts of a 4x4 and an estate in one package. As well as using Audi’s Quattro four-wheel-drive system, the Allroad features air suspension that allows the driver to raise the car’s ride height when driving off-road. At its normal, lower setting, the Audi is reliably stable, with a lower centre of gravity than other 4x4s. We tested the 3.0-litre BiTDI, the most powerful model in the range. The price? Just over £50,000, or considerably more if you lack restraint with the options list. Yes, it is expensive, and versions with lower specifications pack just as much punch. With so much power and torque, it fulfilled our expectations by performing superbly with a caravan in tow, and in everyday driving. The A6 Allroad proved itself to be a practical estate car. It is roomy, but lagged behind rivals in the space it provided for rear-seat passengers and luggage. It was also stingy with luxury kit. Many people think big 4x4s make ideal tow cars, but it’s not that simple. A big off-roader has a high centre of gravity, which does the car no favours in terms of stability or cornering poise. With the Allroad, there are no such issues to overcome. You get the poise in all weathers, which comes with sending power to all four wheels, but the car rides close to the ground like a conventional estate for a lower centre of gravity, better stability and improved handling. That’s the theory. We put it to the test by hitching up to a huge Sterling Elite Explorer twin-axle caravan. With a mass in running order (MiRO) of 1663kg, the Explorer was an 84% match for the Allroad, whose kerbweight is 1985kg. Even with such a long and heavy tourer behind it, the Audi was stable and composed at speed. On the motorway we rarely needed to make steering corrections, even in crosswinds. You could tow with it from Durham to Dover and stay relaxed all the way. The Allroad proved equally capable in our emergency lane-change test. With direct steering, loads of grip and little body roll, the Audi took firm charge of the caravan. On our fastest runs through the lane-change test, the van could be felt pulling slightly at the back of the car, but it never dragged the Audi off course, however aggressively we drove. If anything, the Allroad’s straight-line performance is even more impressive than its stability. The 3.0 BiTDI engine musters 313ps (309bhp) and a colossal 479lb ft of torque. You could argue this much muscle is overkill, even for towing a twin-axle caravan. With so much in reserve, we rarely used more than half throttle on the road. At the test track we found out just how fast the Allroad is by accelerating from 30-60mph in just 6.3 seconds. Thanks to the smooth-shifting eight-speed gearbox, linear power delivery and four-wheel drive, there’s nothing intimidating about using all that power. Being able to accelerate so quickly counts for little if the brakes aren’t able to slow the outfit down again. The Audi’s huge discs slowed the 3.6-tonne combination from 30-60mph in an impressive 10.7m. In regular towing we found the brakes responsive and easy to apply smoothly. Cars with this much power are rarely troubled by the hill-start test, and so it proved with the Audi. The electronic parking brake held the outfit still on the 1-in-10 test hill, then released smoothly. The Allroad pulled to the top of the slope smoothly at low revs and with no wheelspin. We tackled the same slope in reverse with the same result. Judged purely as a tow car, it’s hard to find anything meaningful to criticise. Even the towing gear impressed us, with the ball tucked away under the bumper when not needed. Pulling a catch behind a panel on one side of the boot drops the towball and electrics into place. With such stability, acceleration and strong braking, the Allroad tows superbly. The Audi sets a high standard as a tow car. Is it equally good to drive every day? It’s certainly quick. Chances to use all the performance responsibly in the UK are few, but when a straight road opens up the Allroad BiTDI is fast. It sounds great, too, thanks to some clever manipulation of the exhaust which mimics the sound of a V8 engine. You wouldn’t believe a diesel could sound so good. The engine is at its most tuneful if ‘Dynamic’ mode is chosen using the Drive Select feature. This alters the car’s suspension, steering, throttle and gearbox to fine tune the way the car drives. There are four preset modes: Comfort, Dynamic, Auto and Efficiency. Drivers can also tailor the Individual setting to their own preferences. Select Dynamic, and the car sits lower to the ground, the steering weights up and you get the full benefit of Audi’s tweaks to the exhaust. It makes the Allroad a swift and stable car. Perhaps the steering doesn’t have the feedback of a Jaguar XF’s, but even so this is an effective and enjoyable car on a deserted B-road. The Comfort setting takes the car’s character in the opposite direction. The smooth ride in this mode is excellent, while the Auto setting does a good job of mediating between the two. It’s also possible to adjust the ride height to provide greater ground clearance. It’s a feature we can see being useful to those who stay at out-of-the-way campsites and caravan parks. Whichever setting is chosen, the Audi is quiet and refined at speed, save for some road noise generated through its big wheels. This minor criticism aside, we really enjoyed every drive in the Allroad. It’s the car’s ability to be all things to all people which is so addictive. The Audi A6 Allroad needs to fulfil its brief as a go-anywhere estate car. It succeeds here, too, but shines a little less brightly. There’s a 565-litre, well-shaped boot that’s free of intrusion from the suspension. However, the Mercedes-Benz E-Class estate has 695 litres. That’s a significant difference. Fold the rear seats down – using levers on either side of the boot – and that capacity rises to 1680 litres, although the load floor isn’t completely flat. The cabin is luxuriously finished, as it should be for the price, but those in the back would benefit from a little more knee room. There’s enough space for adults but a few centimetres more wouldn’t hurt. Air vents in the door pillars should keep those in the rear cool on a warm day. Our test car went a step further by having vents between the front seats with separate controls so those in the back could set their own temperature (a £620 option). Up front, there’s no arguing with the head or legroom. After covering hundreds of miles with and without a caravan we have no complaints about the driving position or the supportive driver’s seat. The Audi A6 Allroad is a practical and comfortable car, but there are more spacious estate cars for luggage and rear-seat passengers. The Allroad is an expensive car, especially when fitted with the BiTDI engine. Prices start from £50,105 for this top-of-the-range version, and it’s easy to spend considerably more. In part that’s because the basic spec isn’t all that generous. It’s a surprise to find heated seats an option, for example. Our test car would cost over £62,000 including all the options fitted to it, and by no means every box on the order form had been ticked. The Allroad faces some stiff competition from other Audis. You can have the same engine in the A6 Avant for well over £3000 less. You still get a Quattro transmission, but lose the ability to alter the ride height and air suspension is a £2000 option. The Allroad is pricey, but fuel economy is impressive for a heavy car with such a powerful engine. The 3.0 BiTDI achieves 42.2mpg on the combined cycle, and we saw a best of 41mpg on a solo motorway drive. When towing, the Allroad achieved a creditable 24.8mpg. Strong resale values should help offset the high price. What Car?’s used car experts predict the car will hang on to 47% of its original price after three years and 36,000 miles on the road. However, this is an expensive car and standard equipment ought to be less stingy. So, if you're considering what tow car to buy, is the Audi A6 Allroad the perfect answer? 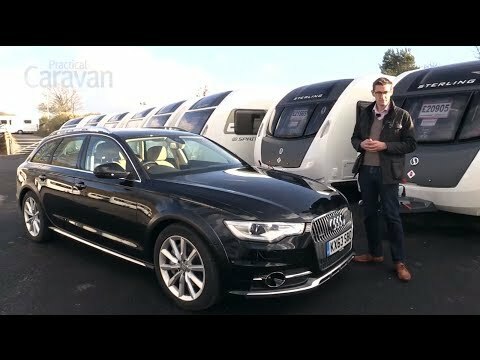 The Practical Caravan review team felt that while it isn’t perfect, this is still a very impressive tow car. Judged purely on its towing ability, there’s little to touch it, even at this price. The engine is the star, delivering effortless speed and surprising economy. The V8-style burble from the exhaust doesn’t hurt either. That speed is matched to top-notch stability. Whether tackling an emergency manoeuvre at the test track or tracking straight on the motorway, the Allroad is composed and confidence-inspiring. Powerful brakes bring car and caravan to a halt quickly and without drama, while hill starts are simple and hassle-free. And for some owners, the ability to drive over rough surfaces without grounding the car would be a definite plus. Without a caravan, the Allroad reveals an appealing split personality: performance car one minute, comfortable family express the next. Change the Drive Select settings and the Allroad changes to suit the road and the driver’s mood. The Audi is also a good estate car, although judged purely on its load-hauling ability you can buy better. Rear legroom could be more generous, although there’s enough space for adults to be reasonably comfortable. The price is high, though, especially for a car with a modest level of standard equipment. The less powerful versions of the Allroad are better value and still have enough muscle to tow a big, heavy caravan. Even so, if we had the means to buy a tow car in this price bracket, the Audi A6 Allroad would be high on our shortlist.